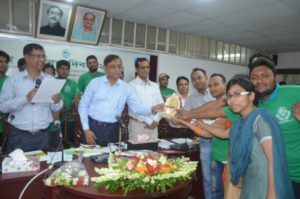 Environmental organization Bangladesh Environment and Development Society (BEDS) received Divisional Environment Award on World Environment day, 5 June 2017. BEDS received the award for its outstanding contributions in Environmental Education Activities. The Chief Executive of BEDS, Mr. Maksudur Rahman received Environment Award from divisional commissioner along with Ms. Ferdausi Sharmin, Ms. Jahanara, Mr. Shantanu Biswas, Mr. Saumitra chakrabarti, Mr. Asadul hasan and Md. Alamin Gazi, other BEDS staffs. At the beginning of the day, BEDS participated in the World Environment Day rally. 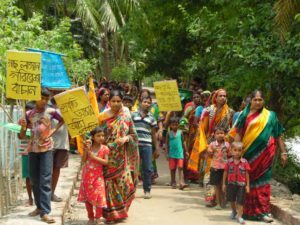 Beside this, BEDS discussed about the importance of the day with the local community of Shyamnagar and Dacope sub district in its office. What is the role of the community to protect the environment was discussed in the meeting. After the discussion, local community promised to avoid those activities which are harmful to environment, everyone will self willingly inspire their family members to protect the nature, and expected to contribute in nature conservation and environmental development. Activities of the day ended with a rally with the local community.